Site of the Savoy, 410 Massachusetts Avenue. All the top acts came here to play. Wally’s, 427 Massachusetts Avenue. Wally’s still opens its doors every night with live music. Site of the Hi-Hat, now the Harriet Tubman House at the corner of Columbus and Massachusetts Avenue. The Hi-Hat was known for big names and big money. The Pioneer Club on 2 Westfield St. was demolished in 1974. The club was a popular after-hours club. 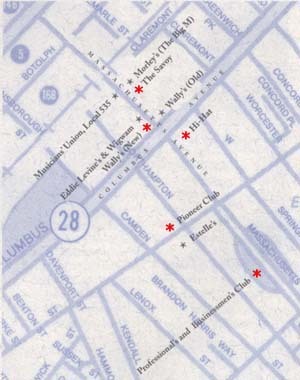 The Professional’s and Businessmen’s Clubs once stood on 543 Massachusetts Avenue. 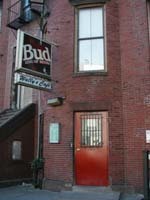 It was here, where you could hear jam sessions until morning if you knew a friend to get you in. Click the red stars to see photos and quotes from the different South End clubs.